The Wall Street Journal Off Duty section is one of my favorite weekend treats. 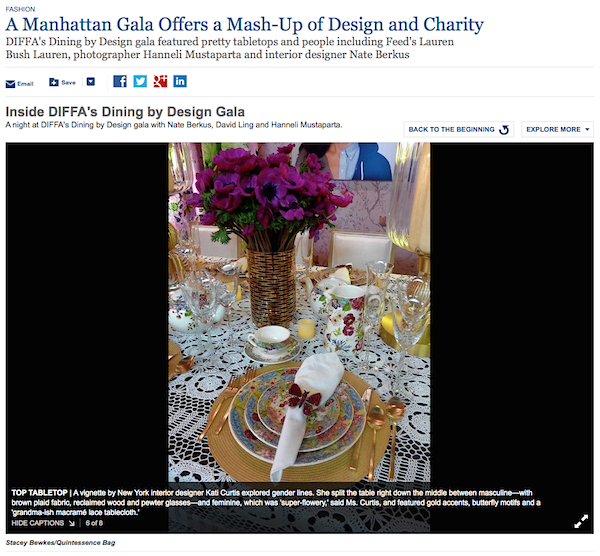 So I was especially pleased to be able to contribute a little something to today’s piece on the DIFFA Dining by Design gala, which I attended last Monday evening. 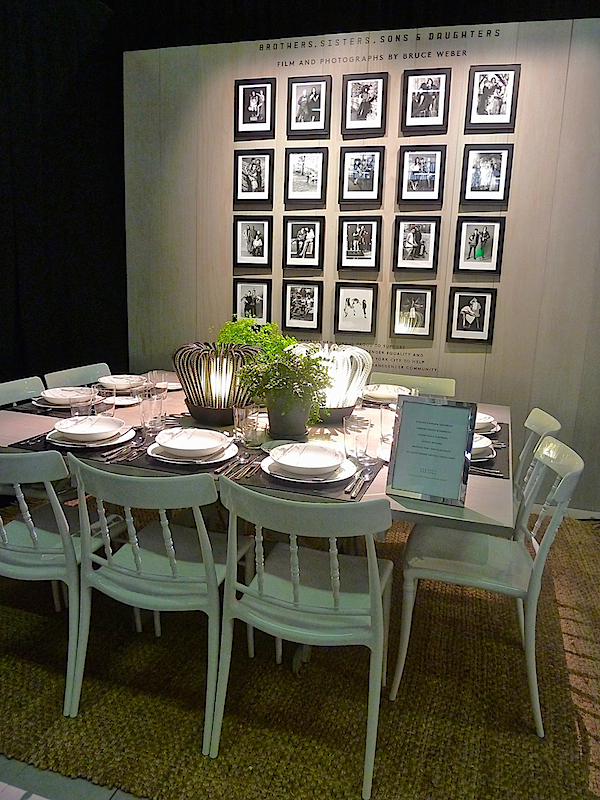 Even though they got the credit wrong online, I was still delighted to have my photo of designer Kati Curtis‘ table for the NYDC featured. Perhaps next time I’ll be able to include some words as well. 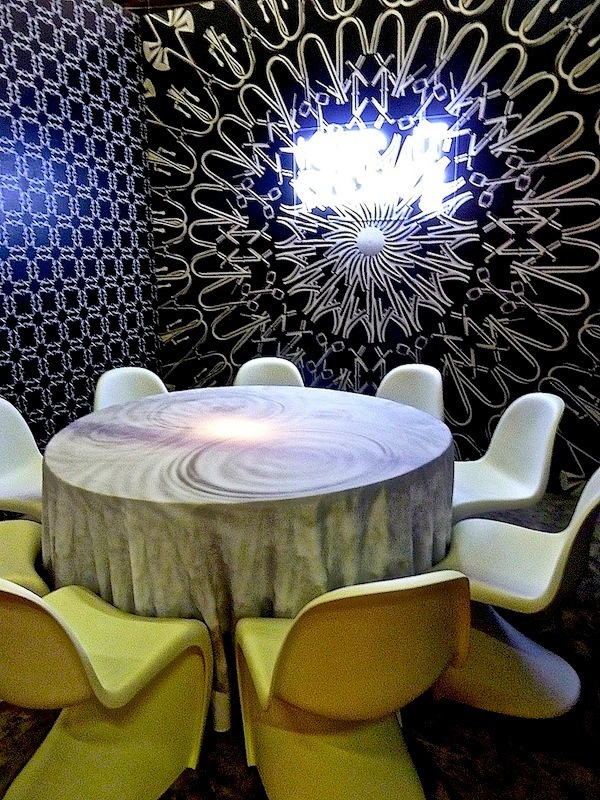 As we take a final tour through Dining by Design, I begin with the Flexform table by Soren Rose Studio for Manhattan Magazine because I especially liked and try to personally prescribe to their message of buy less but better. Their clever vignette was inspired by the experience of visiting a custom tailor, where each piece of clothing can be individually created for each customer, by fabric, fit and style. For those who have a passion for fine craftsmanship and beautiful products, especially when made from sustainable sources, their space honored the unique, the innovative and the luxury of bespoke. 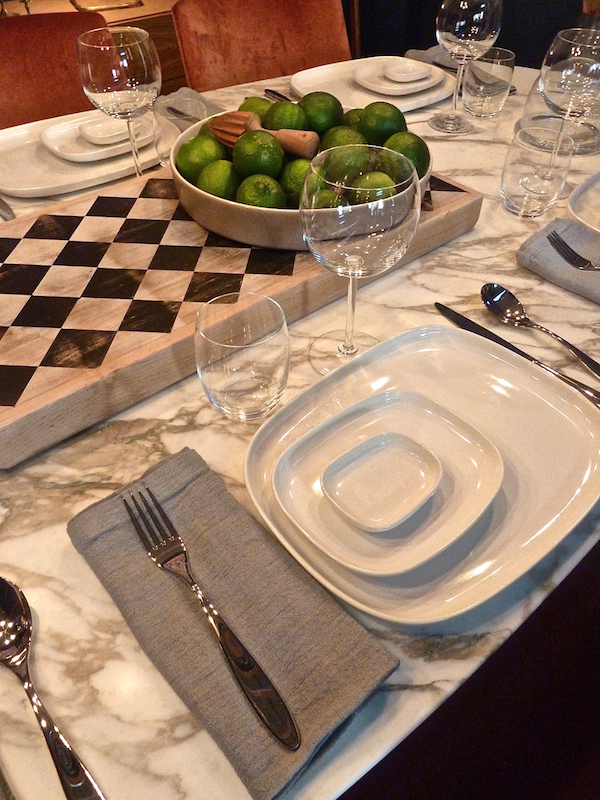 echoed both the rose tone in the Flex Form Feel Good Chair as well as the checkerboard in the custom Silas cutting board created by Peg and Awl, shown on Flexform’s Calacatta gold marble Fly Table. 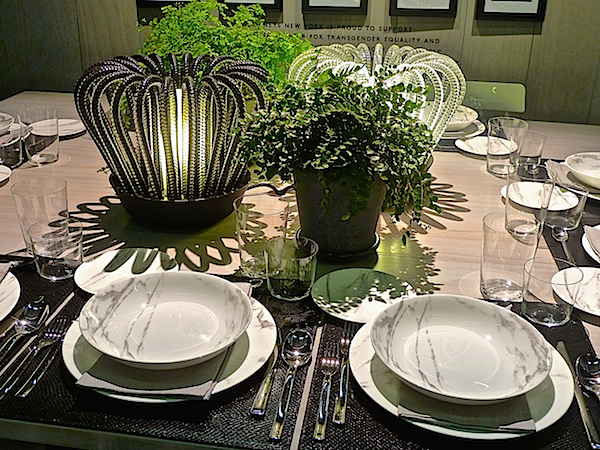 All tableware was Alessi‘s clean and elegant Ovale. 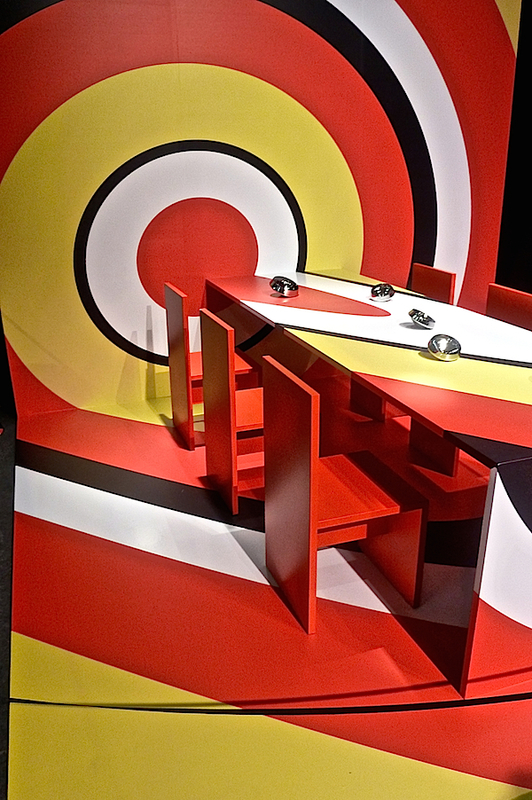 The Pratt Institute table, with mentor Ali Tayar, was a strong statement in graphic colors and design. 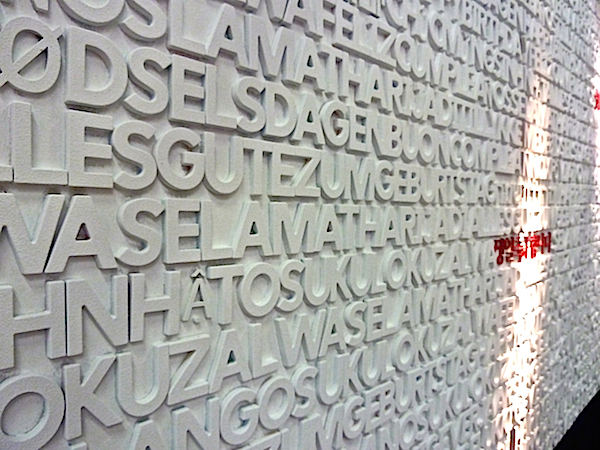 Three dimensional type on the walls created a meaningful enclosure. 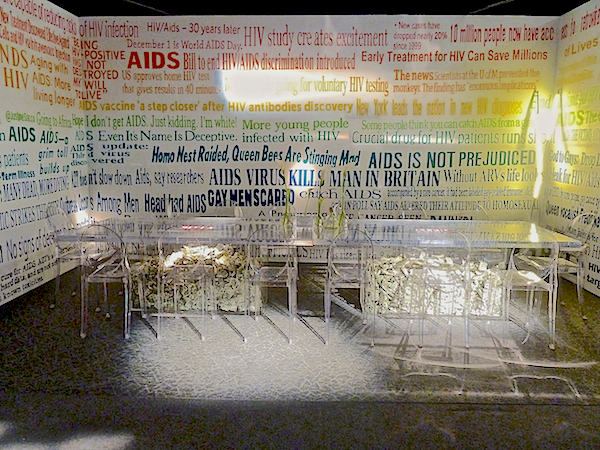 Ali Tayar also worked with Interior Design magazine on their bold table to target the end of AIDS. 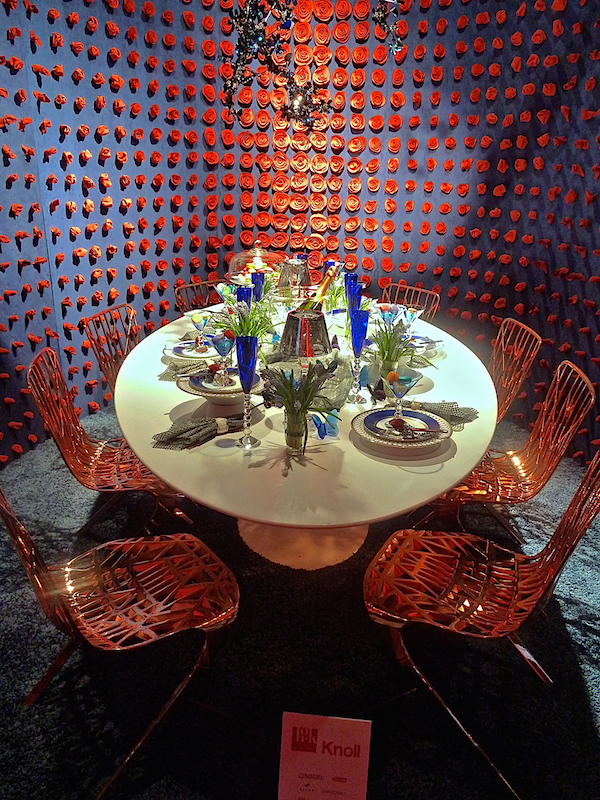 The Benjamin Moore table designed by Jamie Drake also sent a clear colorful message, encouraging others to contribute to the cause. 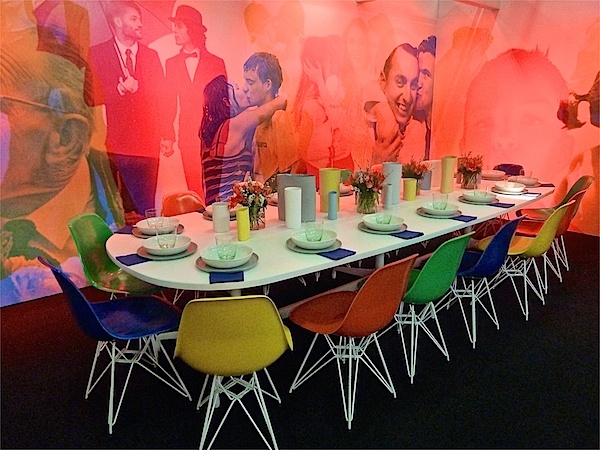 The upbeat celebration of the universality of love designed by Gensler for Herman Miller, included their iconic Eames chairs in a symbolic rainbow of colors. 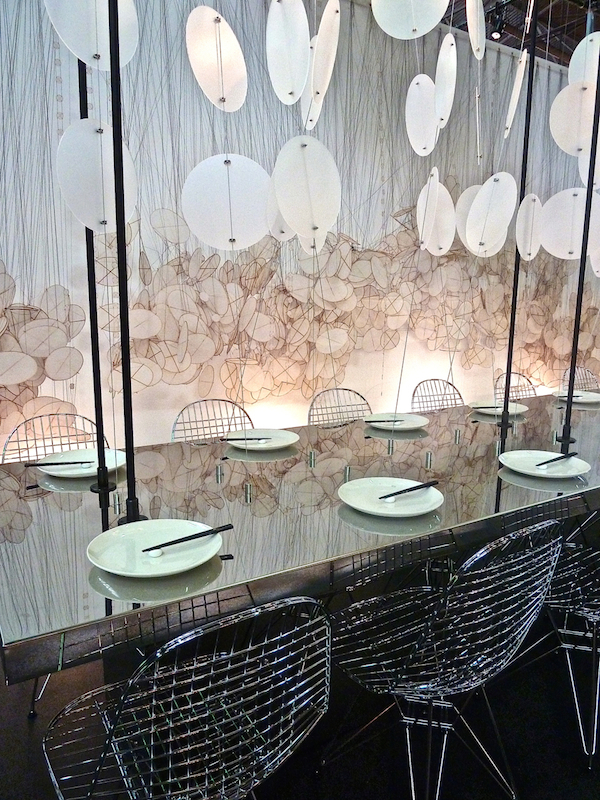 A fabulous custom wall covering by Flavor Paper, amazingly moved, bringing images in and out, from background to foreground, according to the colored lighting scheme. This table so effectively illustrated how the power of design includes so many varying elements that take talent and knowledge to coordinate. IA Interior Architects teamed with Teknion Studio for a modernist vision. The contemporary furniture and the fabulous Foscarini Allegro pendant against the wood walls created a striking contrast. 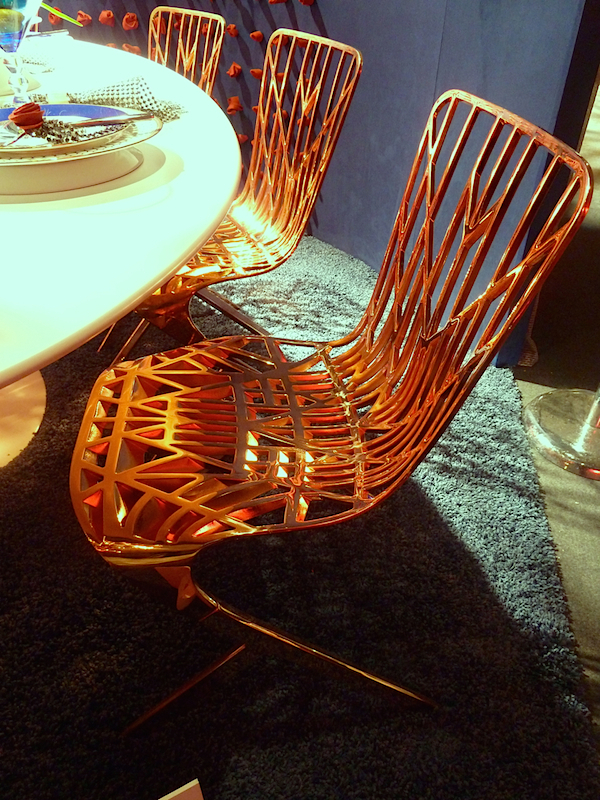 was surrounded by the graphic geometric lines of Washington Skeleton chairs by David Adjaye for the brand. I just love them in their copper iteration. 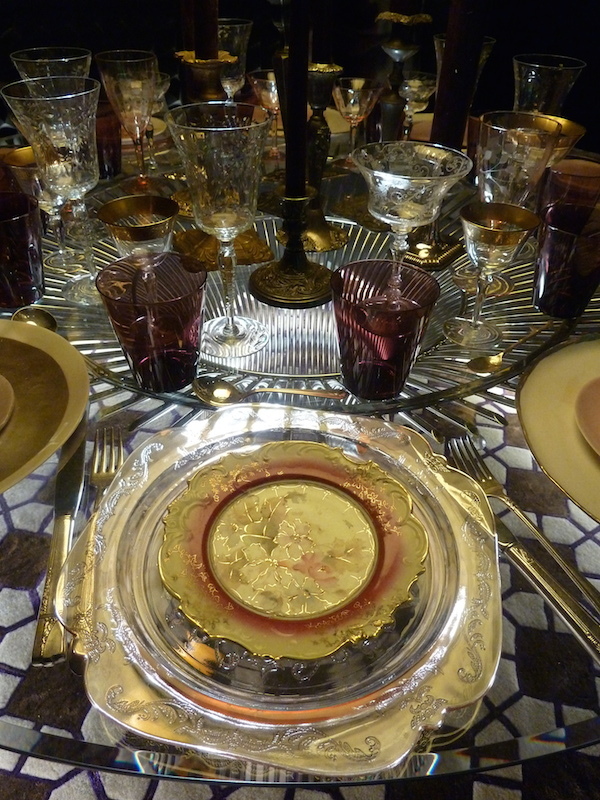 The modern aesthetic of the vignette was surprisingly offset by a luxurious tabletop with Baccarat offerings, echoing signs of spring. 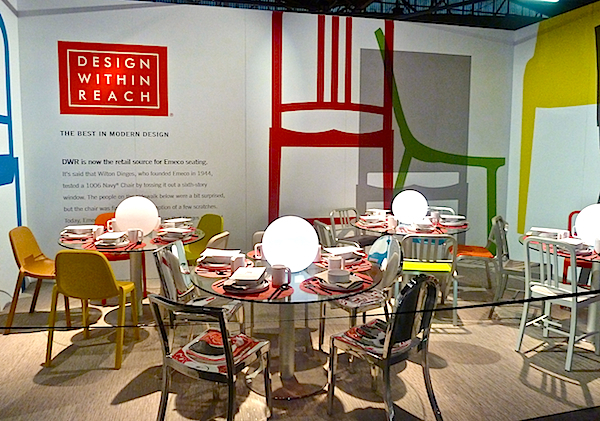 Design Within Reach, a sponsor for the evening, who offers products featured in many of the vignettes, emphasized their Emeco chairs in their large dining space. 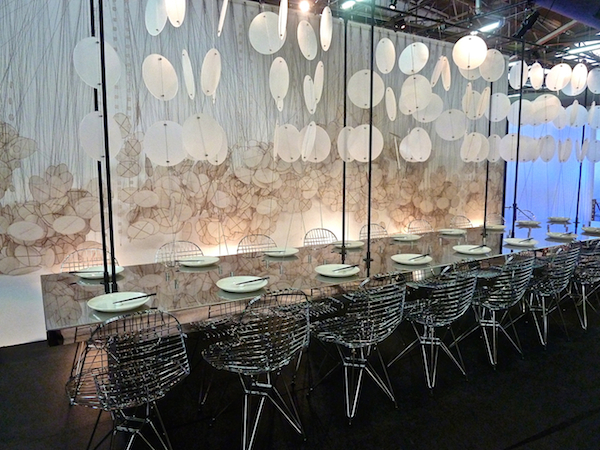 Studios Architecture‘s space was a classic contemporary contrast of textures and form with round fiberglass discs suspended in front of an illuminated wall of similar imagery. 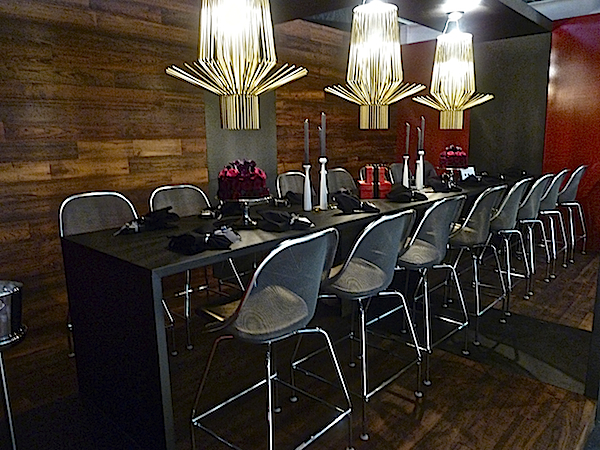 Eames chrome Eiffel Tower chairs and stainless table on a glossy black floor emphasized light and dark and geometric versus more organic form. 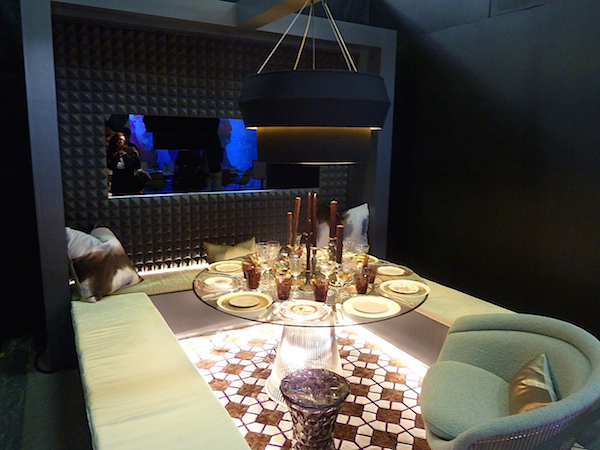 M Moser‘s dining fantasy was an interesting interplay of vintage and modern with exotic and sleek. 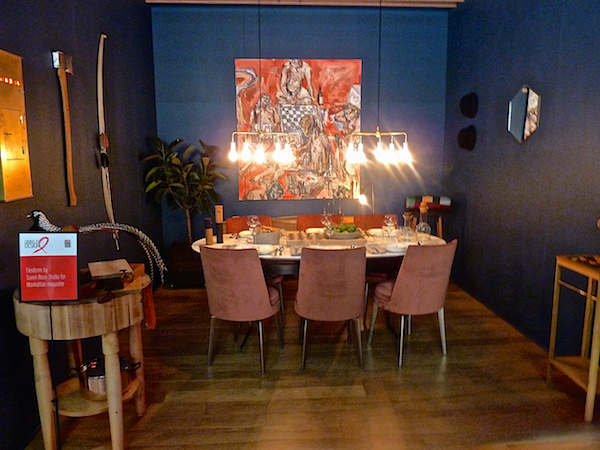 A handsome Rich Brilliant Willing Delta IV light was a perfect match for the classic Warren Platner dining table. And the geometric pattern of the retro-feeling rug was echoed in the futuristic fabrication of the wall. Tie dye pillows and tub chair had instant 60’s time warp appeal. Even the tabletop seemed to echo the old and new mix. 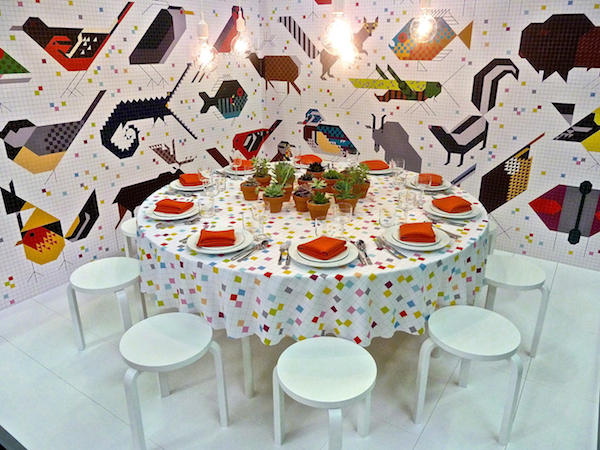 Designtex‘s happy booth featured flora and flora dominated Charley Harper wallpaper and the form meets function E27 Pendant Lights from Swedish designer Mattias Ståhlbom. 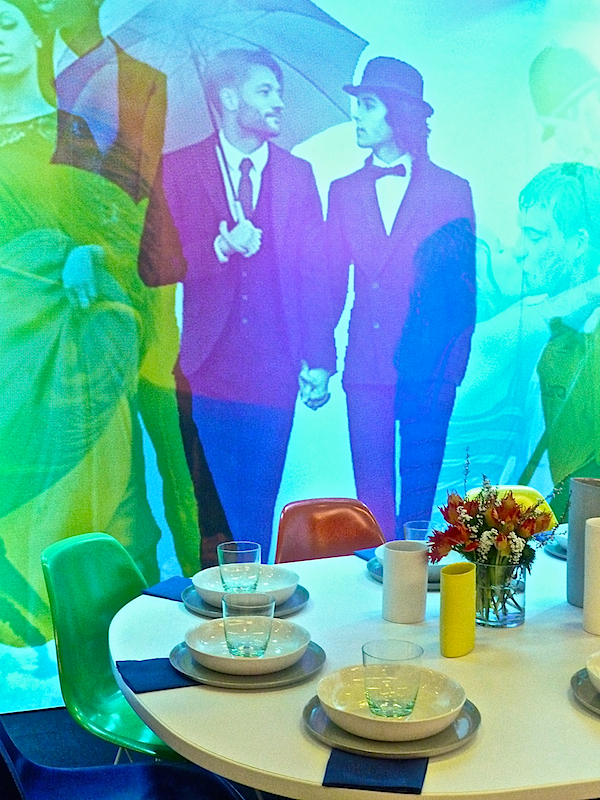 And lastly, Barney‘s table featured the work of iconic photographer Bruce Weber from his transgender Brothers, Sisters, Sons & Daughters project which was the basis for the store’s spring campaign. If you haven’t seen Barney’s windows or the catalogue they produced, it is a very moving collection of personal stories by individuals with interviews by author and Vanity Fair contributing editor Patricia Bosworth. 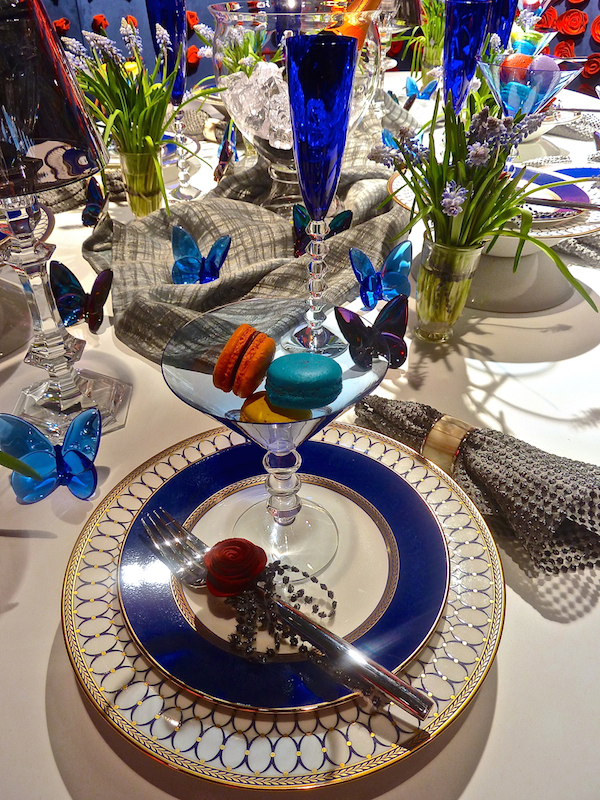 The tabletop featured chic selections from their Chelsea Passage department including Dibbern table and glassware, Alessi flatware, SFERRA napkins, Barneys New York placemats and stunning Saint-Louis Saule crystal table lamps by Ionna Vautrin. Stay tuned!! It’s going to be a very busy week so stop back tomorrow for more stories behind the style. 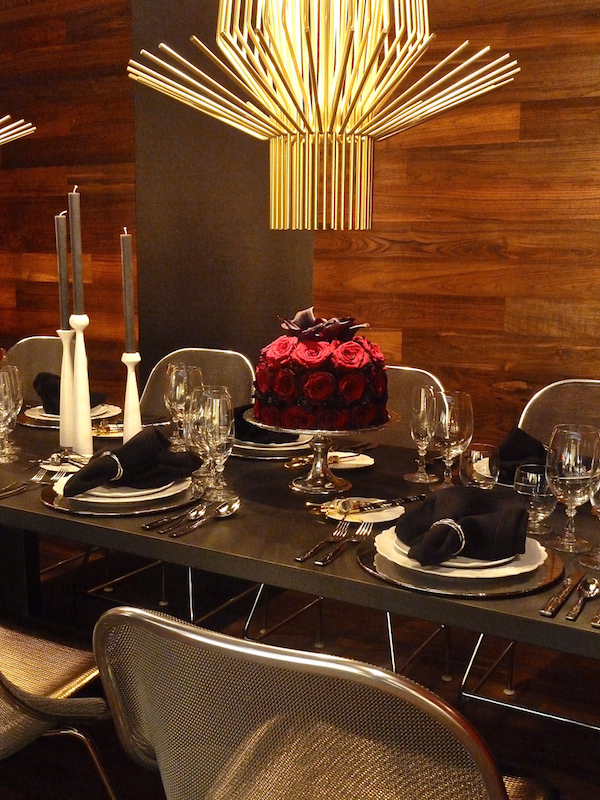 This entry posted in design, furniture, interior design. 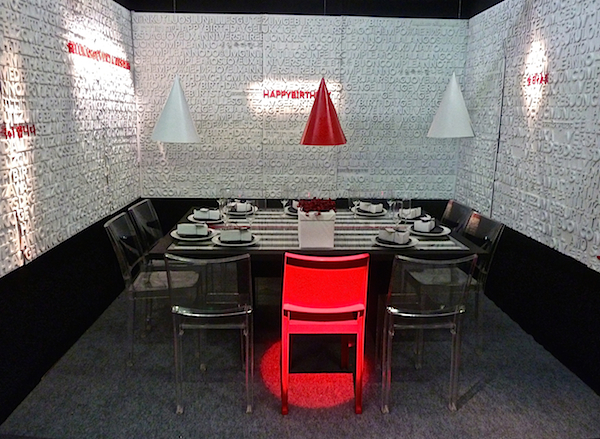 Entry Tags: DIFFA Dining by Design, interior design, Tabletop, Wall Street Journal Off Duty Bookmark the permalink. 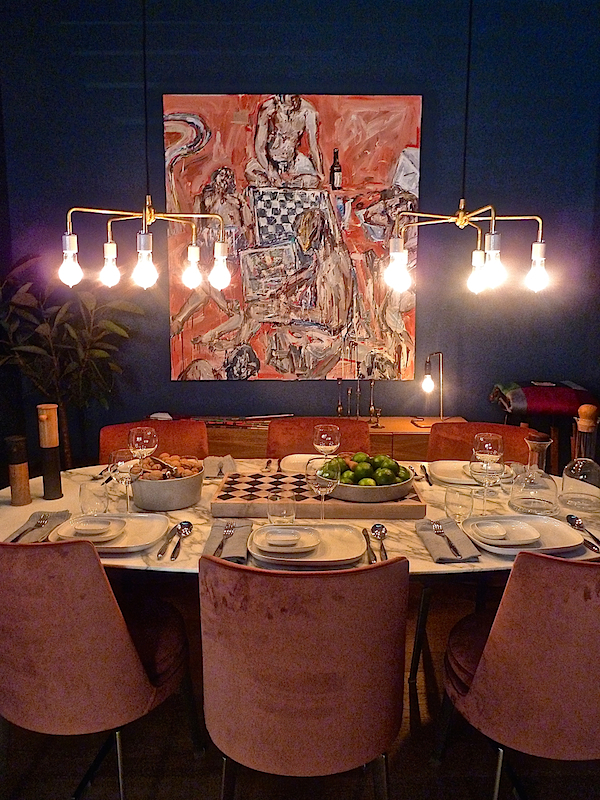 Those Harrison pendants are super and the copper Washington Skeleton chairs, so striking! Credit or no credit, you’re still fabulous. And great post. 78 queries in 0.819 seconds.